"Racial tension in a maximum security prison is brought to a boiling point when Vito, a Mafia hit man, falls in love with Jangles, a black prison queen. This places Gypsy, leader of the biker population, in a very precarious position. He must do something to stop a race war from happening. "Joining forces with Slick, a powerful black gang leader, and Mustapha, a Muslim leader, they try to find a way out for the safety of the entire prison population. Fighting time, the administration, and the very inmates they are trying to save, they walk a doom-laden tightrope. 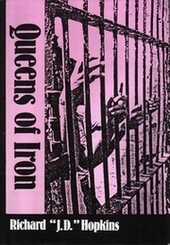 "Queens of Iron, by Richard [J.D.] Hopkins, offers a frightening glimpse of the inner workings of prison life." So state the inner dust-jacket notes of Richard Hopkins' Queens of Iron. What the liner notes don't say is that Queens of Iron is a gripping tale of unsung heroic deeds, doomed to failure even as the reader hopes they will succeed. Building from a slow start, Queens of Iron weaves together the lives of Gypsy, a biker in for shooting his way out of a barfight, and his fellow inmates, becoming a tense drama of prison love and gang hate. Maddeningly understandable characters and situations leave the reader virtually shouting warnings, as though at the movies trying to save the heroes. Far from being an alien environment, the prison backdrop becomes almost transparent as you realize people really ARE the same all over - even here! The same forces drive some together and others apart, and the same results occur. This is a tale that anyone can relate to - the struggle of good and evil, the huge gray area in between, and the compromise of living in the real world. Since getting kicked out of high school in 1965, RICHARD "J.D." HOPKINS has been on a life-long odyssey that has included many strange, often exotic scenes. 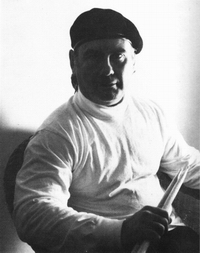 As a professional musician and pot dealer, his encounters with other musicians, drug dealers, artists, political radicals, bikers, mystics, ladies of the night, and assorted crazies has been a useful tool in his writing. In addition, the six years he spent in prison were quite useful in adding to the realism of Queens of Iron. He is divorced and has four children. Published by Vantage Press, Inc.